For those of you who really know me out there, you know that I am from Maryland and I have a thing about crab cakes. I have a thing about seeing crab cakes on social media sites that bear the title of "Maryland Crab Cakes: when they are not even close. When I say I have a thing about it...I mean it drives me nuts! Typically the crab cakes you see out there are full of peppers and onions and tons of filler and the sweet succulent blue crab is totally lost. A real Maryland Crab Cake "celebrates" the crab. We do not cover up the flavor of it! So today, I want to show you what a delicious, authentic, Maryland Crab Cake is and how to make them. You can thank me later. Preheat oven to 400 degrees. 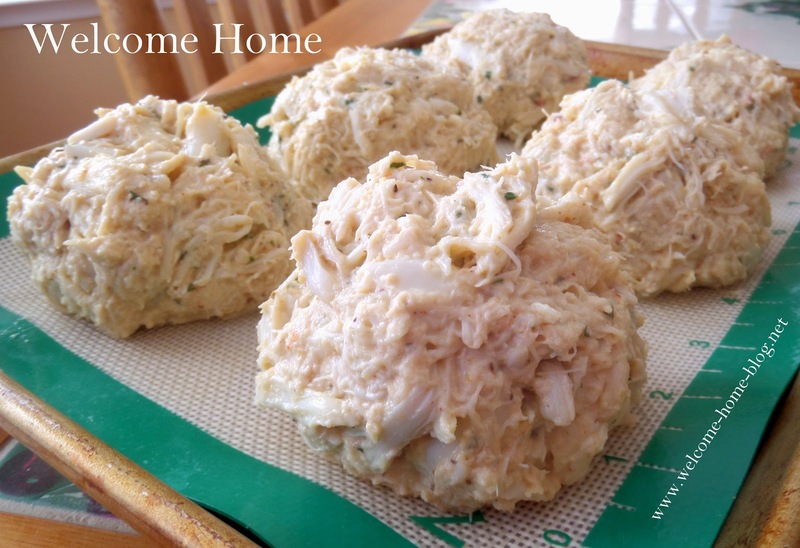 Drain crab meat and put in a bowl and set aside. In a medium bowl, whisk the egg, mayo, mustard, Old Bay, lemon juice, Worcestershire sauce, and 1/4 teaspoon salt. Gently stir in crab meat and breadcrumbs and mix with hands lightly without breaking up the lumps. Mixture will be somewhat wet. Cover with plastic wrap and refrigerate for an hour or more. Once chilled, shape the mixture into rounded mounds whatever size you'd like. Do not flatten or make into patties. Place on lightly sprayed baking sheet with sides. Spray the tops very lightly with non-stick spray for browning. Just look at those big lumps of sweet succulent crab! Just before putting crab cakes in the oven, drop two or three ice cubes onto the baking pan in between crab cakes. This will keep the high temperature from burning the bottoms. Bake in hot 400 degree oven for 10-15 minutes depending on the size you made your crab cakes. In Maryland, the home of the most incredible crab cakes, we judge the perfect crab cake as one that has mostly sweet Chesapeake Bay Blue Crab and very little filler! And NO PEPPERS or vegetables or any other nonsense that might take away the taste of that sweet wonderful crab! Just enough filler to hold them together. Look at that crab! Can't you just taste them! Oh My Goodness. There is nothing like a Maryland Crab Cake! 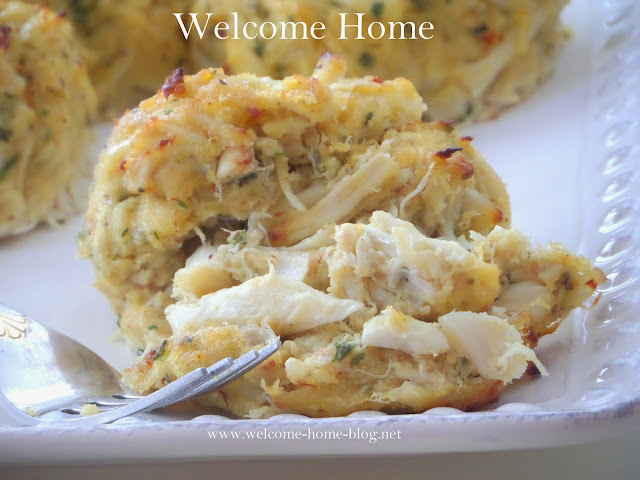 This recipe makes 4-5 big jumbo lump crab cakes. These look and sound wonderful. Can't wait to male them myself! Thank you for sharing it, Marty! Oh yum! Love crab cakes! You have this recipe nailed down!! I gave up ordering crab cakes at restaurants because I am continually disappointed. There is too much filer with breading, peppers and so on which makes a beautiful thing just plain mush!!! Where did all the crab go? I’m not from Maryland but from Virginia and we like our crab and Old Bay too!! Crab is not cheap, which is why we have so much filler but I have something to say about that...do them right or don’t do them at all!! We don’t want bread crumbs with a hint of crab. We want crab with a hint of bread crumbs and the flavor of good Old Bay! !